Nail clippings flying in my face! Ack! | Be Nice. Nail clippings flying in my face! Ack! My friend Dave sent me a link today to this article about signs posted in the NYC subway to encourage etiquette. Pretty freaking awesome, no? 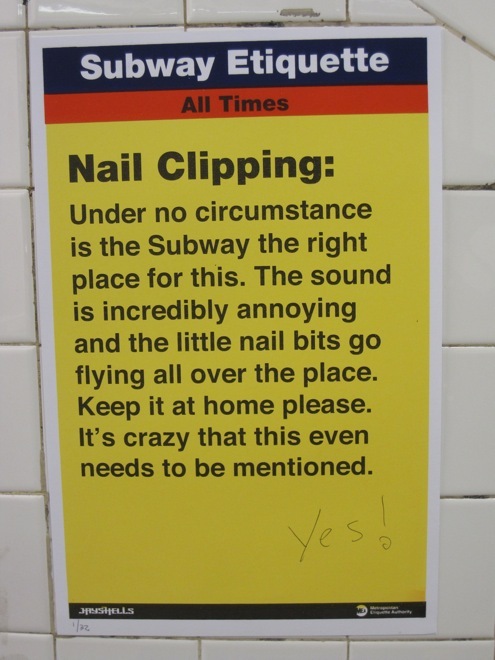 Can you imagine, some stranger’s nail clippings flying at you on your subway ride home?!! Yuck yuck yuck! I totally support this sign’s message! End the public nail clipping! You can see a few more here at the site of the artist Jason Shelowitz. The “yes!” is encouraging! Glad so many people agree! PS: The Kickstarter for Be Nice is going really REALLY well! Less than $30 to go!!! Still 2 months left, so who knows how far this might reach! Thanks to all of you, and keep spreading the word! Not sure what I’m rambling about, click here or here. This entry was posted in Amicable Allegories, In Traffic, Perspectives on Be Nice. and tagged etiquette, Jason Shelowitz, nail clipping, subway by Jen. Bookmark the permalink. I am an accountant and my previous boss would clip his nails in his office during the day. The first time I heard it I stood up to ask my co-worker if I was really hearing what I thought. He agreed that our boss must have been clipping his nails at work! I couldn’t believe it – especially for his position in such a professional business. But thankfully the clippings were only in his office, so I decided not to be overly disgusted and instead just laugh. Thereafter, every time I was working and started hearing a random “clip”….”clip”… I would stand up and look at my co-worker and we would both chuckle.